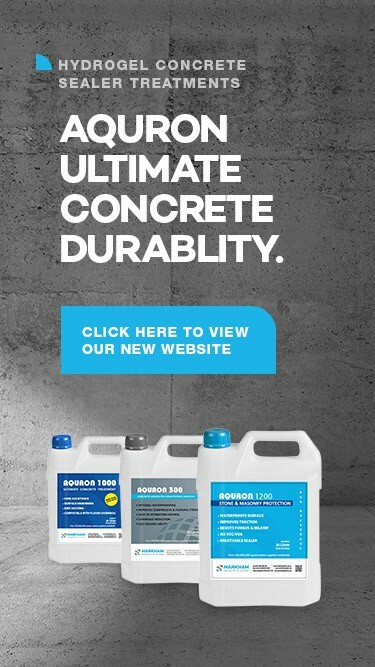 AQURON 300 Additive is added to concrete's mixwater at the rate of 6.5ml per Kg of cement. (This normally equates to approx 2L per m3 of concrete). It is essential that AQURON 300 is mixed with bulk of water BEFORE adding to cement and aggregates. AQURON 300 increases cement particle saturation and with sufficient mixing improves cement utilisation adding more desirable hydration products and an extended cementitious structure. AQURON 300 delivers unmatched quality and performance, easier construction while reducing costs. AQURON 300 Additive must be diluted with 80% of the mix water, before it contacts the cement/aggregate. Failure to dilute the AQURON 300 Additive may result in concrete strength and workability being reduced. Adding AQURON 300 to be completed mix can cause a "FLASH SET". The total mix must be kept mixing for a minimum of 180 revolutions. When using AQURON 300 additive, the concrete's Water/Cement ratio is normally between 0.40 and 0.54. When W/C is sufficient, AQURON 300 mixes should have very little blend water. Slump being adjusted with clean water. Note: very little added water usually dramatically increases slump. If mix design requires other additives, call Aquron Representatives to check product compatibility.